The Wabbit was just emerging from the Publishing House, when he heard a yowl and turned around. "I've heard all about the book," said Skratch. "Isn't it exciting! Is that our book there?" "It's a first draft." said the Wabbit, "and I dropped off a copy with the publishers." "When will we know?" asked Skratch. "Oh I think it takes a long time. They get a lot of submissions," said the Wabbit with a frown. "Perhaps I can help," said Skratch. The Wabbit looked dubious. "I'll just sneak in and put our book at the front of the submissions queue," said Skratch. 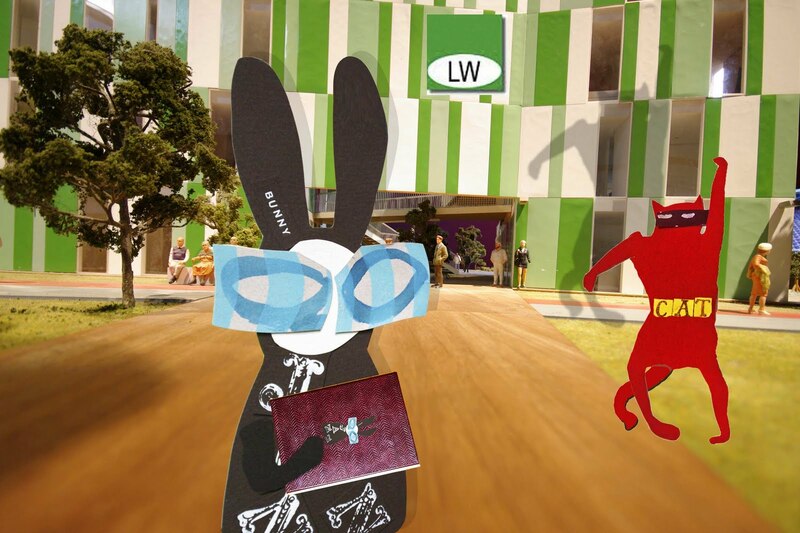 "That's not very fair," worried the Wabbit, "because others have worked hard on theirs." Skratch looked at the Wabbit as if he was a hopeless case. "Then let me suggest something else," he said. "OK. Go ahead," said the Wabbit. Skratch mimed a cat's walk in a most amusing manner. "I'll just prowl in," he laughed. "Won't they see you?" interrupted the Wabbit. "Yes, but no one minds a cat prowling around," said Skratch. "Pray continue," said the Wabbit. "I'll find the correct desk and accidentally knock down the pile of submissions with my tail," smiled Skratch. "How does that help?" asked the Wabbit. "When I am carefully replacing them, I will place our book on the top!" said Skratch with triumph. "Let me get this right," said the Wabbit. "You knock over the books and helpfully put them back." Skratch waved a paw. "And our book is at the front of the queue," he purred. "That sounds more ethical." said the Wabbit.